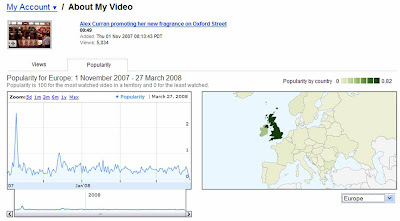 YouTube have launched a new, free Video Analytics tool that anyone who has uploaded content to YouTube can use. 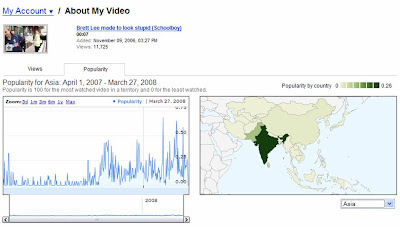 ‘YouTube Insight’ allows YouTube Users to see more than just the view count of a video. 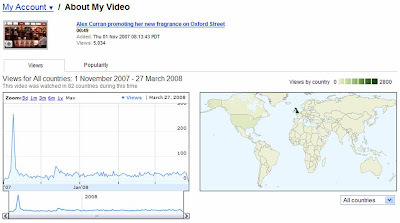 YouTube Insight allows users to see how video views have accumulated, where the video has been watched (global and regional breakdowns) and gives a popularity rank indexed against all videos in that region over time. 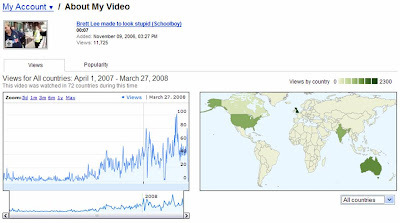 YouTube Insight can be accessed under the "About this Video" button under "My account > Videos, Favorites, Playlists > Manage my Videos" and I have used it to look at two videos that I have posted to YouTube over the last year. Rather than peaking after initial upload, views for this video are growing gradually over time with spikes of interest whenever Australia play cricket. Data does not go back far enough to see what happened over the last Ashes series, but YouTube Insight Popularity rating shows that there has been significant viewing in India recently in line with the current series of matches between Australia and India. Think this is useful data and, when coupled with recent developments in tracking, the implementation of YouTube Insight can only enhance YouTube as an advertising proposition.